27 Animals In 'Hobbit' Movie Died At Farm Where They Were Housed : The Two-Way Three horses and two dozen smaller animals reportedly died. Wranglers say there were sink holes and other "death traps" on the property. The movie production company later paid for improvements at the farm. Director Peter Jackson's movie premieres later this month. A promotion for J.R.R. 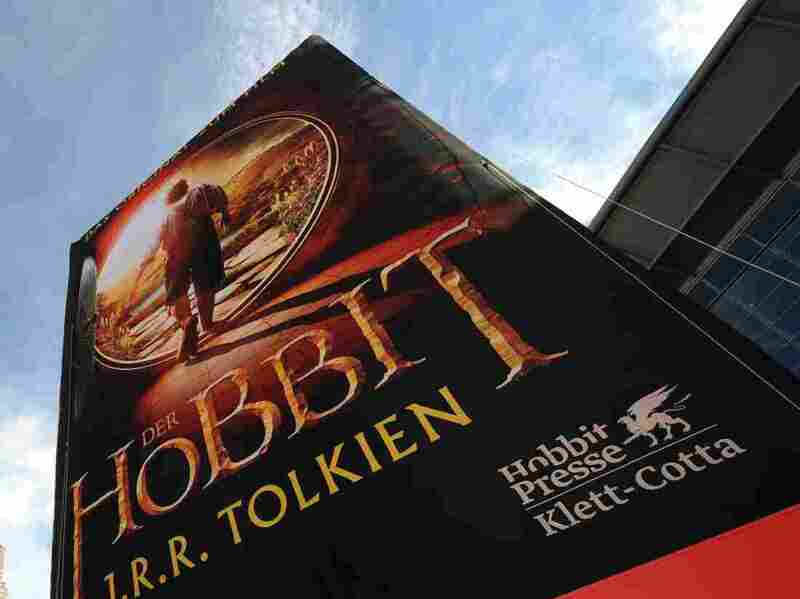 Tolkien's classic, which is now being made into a movie trilogy, at the Frankfurt Book Fair last month. Just days before the movie's premiere, there's word that during the filming of director Peter Jackson's The Hobbit: An Unexpected Journey as many as 27 animals used in its production died at the farm in New Zealand where they were housed. Animal wranglers tell The Associated Press that there were "bluffs, sinkholes and other 'death traps' " at the farm. Three horses died, along with "six goats, six sheep and a dozen chickens." "The first horse to die, he said, was a miniature named Rainbow." "In 2011 while filming was being conducted in New Zealand, the production company made us aware that some of the animal actors being used for the production had died while on a farm that was being used only as housing. None of the animals in question died during filming action or were being used as animal actors when they died. As our jurisdiction does not encompass off set activities, our on-set representative had not previously conducted a review of the farm. Nevertheless, after the deaths, upon the request by the production company, we traveled to the farm and conducted a thorough examination. We made safety recommendations to the animals' living areas. The production company followed our recommendations and upgraded fence and farm housing, among other things. Working together with the production company, we were able to increase safety for animals on the farm." According to the AP, Jackson spokesman Matt Dravitzki "acknowledged that horses, goats, chickens and one sheep died at the farm near Wellington where about 150 animals were housed for the movies, but he said some of the deaths were from natural causes." In response to the news, People for the Ethical Treatment of Animals has launched an online petition to tell filmmakers "that hurting and killing animals for a film is unacceptable" and is urging movie fans to "refuse to see movies that do." Jackson plans to film a Hobbit trilogy (as he did with Lord of the Rings). An Unexpected Journey premieres Nov. 28 in New Zealand and opens in the U.S. and around the world next month.